2012 Upper Deck Exquisite Football. 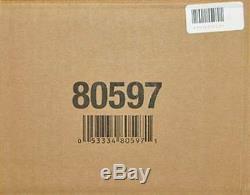 Factory Sealed 3 Box Hobby Case. Look for (5) Hard Signed Autograph Autographs Per Box including 1 Rookie Autographed Patch #ed to 150 or less. 2012 Upper Deck Exquisite Football is part young stars, part veterans, part retired legends and all high-end. As always, everything in 2012 Upper Deck Exquisite Football is extremely limited and made with premium quality. Rookie Auto Patch cards fall one per box. Focusing on the loaded 2012 rookie crop, each has an on-card signature and a compelling patch from a player-worn college jersey. There are 30 cards in the set. An extremely limited number of trade cards are good for a complete set of Rookie Auto Patch cards. Every 2012 Upper Deck Exquisite Football box also promises either an UD Black or UD Black Rookie Lustrous card. These cards use a dark card stock with a gold autograph. Rookies also have a patch swatch. 2012 Upper Deck Exquisite Football has several other autograph inserts, including inscribed Alumni Pride , Exquisite Dimensions, Legacy Signatures, Exquisite Art and Exquisite Book Marks. Multiple autographs can be found on Exquisite Sixteen, Exquisite Choice Duals and Exquisite Choice Quads. Every three-box case has signatures from at least two of the following players: Robert Griffin III, John Elway, Aaron Rodgers, Jerry Rice, Barry Sanders, Dan Marino, Joe Namath, Russell Wilson, Ryan Tannehill and Trent Richardson. Product Configuration: 1 pack per box, 6 cards per pack Price Point: Ultra High-End Football Card Target Audience: Hit Seekers, Autograph Collectors, Exquisite Fans. 2012 Upper Deck Exquisite Football Box Break. 1 UD Black or UD Black Rookie Lustrous Autograph. Configuration: 1 packs per box. Find the following Hard-Signed Auto's in every box. One (1) Rookie Autographed Patch Card #'d to 150 or less - One (1) UD Black or UD Black Rookie Lustrous Signature #'d to 99 or less - Three (3) additional autographs #'d to 99 or less. Exquisite Rookie Book Marks (#'d to 50) - Exquisite Sixteen (#'d to 1) - Exquisite Ensemble Dual, Triple and Quad (#'d to 30 or less) - Exquisite Art (#'d to 15) - Exquisite Dimensions (# to 60) - Exquisite Choice Dual and Quad Signatures. Delivers all 30 Rookie Signature Patch cards hand numbered to 3! Find 30 of the top 2013 Rookies! Redeemed cards are hand numbered to 10! Exquisite Rookie Book Marks (# to 50) - Exquisite Legacy Book Marks (# to 10) - UD Black Rookie Lustrous Signatures (# to 75 or less) - UD Black Rookie Lustrous Signatures Patch Parallel (# to 5) - UD Black Lustrous Legends Signatures (# to 15 or less) - UD Black Lustrous Legends Signatures Patch Parallel (# to 3). Exquisite Endorsements (# to 99 or less) - Exquisite Inscriptions (# to 15 or less) - Exquisite Legacy Signatures (# to 60 or less) - Exquisite Alumni Pride (# to 10 or less) - Exquisite Ensemble 2 Signatures (# to 30 or less) - Exquisite Ensemble 3 Signatures (# to 15 or less) - Exquisite Ensemble 4 Signatures (# to 10 or less) - Exquisite Sixteen Signatures (# to 1) - Exquisite Regular Card Signature Parallel (#'d to 1) - UD Black Signatures (# to 99 or less) - Exquisite Dimensions Signatures (# to 60 or less) - Exquisite Art Signatures (# to 15) - Exquisite Art Dual Signatures (# to 5) - Exquisite Choice Signatures \t Base Set/Regular Cards. Regular Cards (# to 75) - Exquisite Rookie Signature Patch Cards (# to 150 or less) - Exquisite Rookie Signature Patch Cards Parallel (# to 50 or less) - Exquisite Rookie Signature Patch Cards Spectrum Parallel (# to 1) - Exquisite Rookie Signatures (# to 99) - Exquisite Rookie Signatures (# to 1) - 2013 Exquisite Rookies (# to 175). 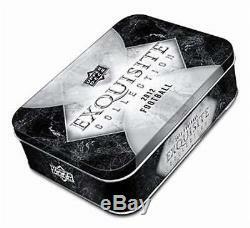 The item "2012 Upper Deck Exquisite Football Factory Sealed 3 Box Hobby Case" is in sale since Friday, August 3, 2018. This item is in the category "Sports Mem, Cards & Fan Shop\Sports Trading Cards\Football Cards". The seller is "sportscardsetcpgh" and is located in McKees Rocks, Pennsylvania. This item can be shipped worldwide.